Nowadays people are not well educated on the topic of pregnancy. But this process requires lots of understanding and awareness from both parents, the mother and the father. In order to go well through all the phases of pregnancy and child-rearing both parents especially the mother should consult good sources of information as well as take into consideration other women experiences. And where can you get in-depth, detailed information today? Right, on the internet. World wide web nowadays stands as a great source of information on pretty much everything you need. Pregnancy is not an exception. 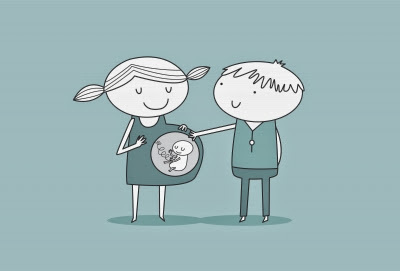 If you consult Google, you will find plenty of web pages, blogs and forums on getting pregnant and raising a child. Forums are great for sharing knowledge with other women more experienced than you. That is why, we do highly recommend that you consider this option which is absolutely free and contains loads of information that you might find to be very useful – try Moms.com. Also a very important aspect to consider is the popularity and the reliability of the web page, blog or forum. Make sure you read some reviews on the web if there are any in order to familiarize yourself with the quality of the content exposed on the web page. It is important that you consult your family doctor before taking into consideration the advices on medicine and nutrition that you find on the web. Your child’s health comes first. Therefore, let these sources serve as a great support and training for the areas you’re not knowledgeable about. But don’t rely only on them. Seek medical advice when required. It must be very difficult for a child to experience a very serious illness earlier on in life. I can only imagine what they have to go through + what their parents have to go through to make sure they stay healthy + well. Having a sick child can be very taxing + heartbreaking to any parent or family. That is why it is a must that we do our share to help them in what little way we can. Mum came across Carlisle + his mum through their common friends online. 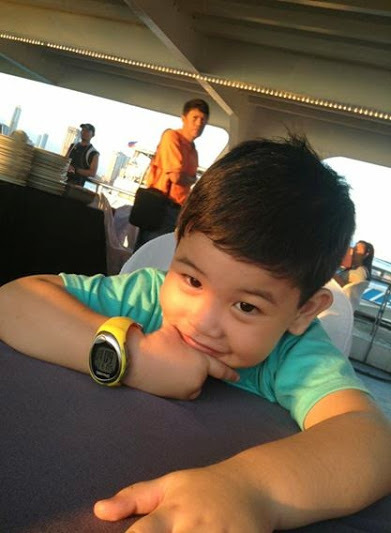 He was diagnosed with brain tumor + to help fund his treatments + medications, her mum thought of putting up the Dinner For Carlisle event on 27 September, 2014. 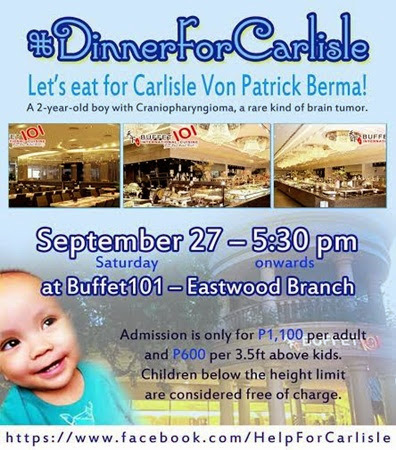 Buffet 101 Eastwood branch will be hosting a dinner-for-a-cause event for Carlisle. The #DinnerForCarlisle buffet is priced at Php 1,100 for adults and Php 600 for kids 3.5 ft and above. Children below the height limit is considered free of charge. Part of the sales will be for Carlisle’s hospital funds. Dinner starts at 5:30 PM. If you have no plans for the weekend, make sure to go there + help Carlisle’s mum. 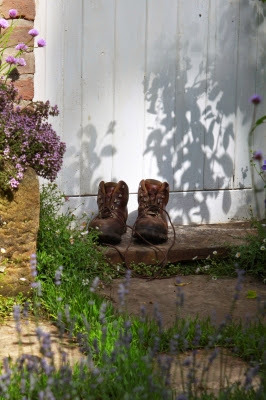 It’s easy to romanticize gardening and certainly, for some people, it truly is the most enjoyable way to get outside, get some exercise and reduce stress. However, for families, professionals or simply those who live in a region with extreme temperatures, the idea of gardening can be more appealing than the reality. Not everyone is a gardener, just like not everyone is a basketball player or into knitting. You should figure out what the reality of your gardening skills and time commitments are before picking a property based on gardening potential. As a renter, you’re in a great position. Some landlords have property management companies that take care of basic landscaping for you. If you’re not a gardener, this fee is included in your rent and you don’t have to worry about braving the scorching heat or freezing temperatures to mow and edge your lawn. Other properties are for rent with the understanding that the tenants will take care of the landscaping. Consider this a vital factor when looking for a new rental. bedroom wall stickers: home is where the heart is! Bedroom wall stickers are not the newest addition to wall improvement techniques, but the new designs and versions of the wall stickers for bedroom are definitely one of the most important aspects which all of us must keep in mind before planning to shift to a new apartment. When I decided to refurbish my bedroom, I was totally clueless whether to install Mythical figures, or pictures of natural objects, birds, geometric designs, or textured color templates, but my husband came up with an innovative idea, that would not just add a naughty flavor to the wall décor, but that would also spark up our relationship in the bedroom. When I asked him how to choose wall stickers for bedroom, he just answered me with a twinkle in his eyes: “Let us stick some romantic wall papers. After all, we have been married for one year now.” So, I bought a whole new range of wall papers which had lovely romantic pictures, and a palette of colors which could be reflected both under the bright light and the faded out night lamp in the bedroom. The wall stickers were so energizing that they not only reflected a calm spirit inside the room, but they also increased the aesthetic sense to a large extent. 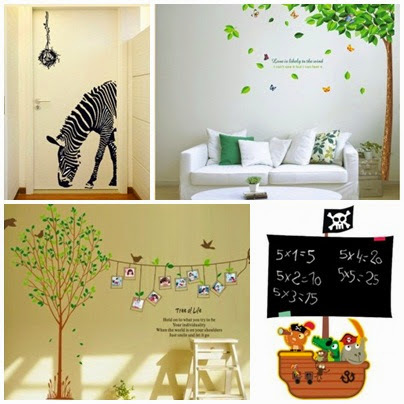 Discussion about wall stickers and their price range: it is important before we buy them! • The dimension and the direction of the bedroom. If the bedroom walls are too large and they have a great height, then bedroom wall stickers in wide and colorful prints can be installed. • The light and darkness combination is important. For example, when we tried to stick on wall papers in floral prints on the North-East corner of the room, we found that the prints were not visible easily, because the area was dimly lit. So, when we lit an incandescent light, the floral prints were easily visible. So it is important to determine the light and darkness features of the bedroom, before buying wall stickers. • In case of fluorescent lamps, there can be color variations with respect to the wall stickers. The accurate images in Red, Blue, and pink can give dull and often more cloudy looks, so we must furnish the floor arrangement, and the lighting system of the room, to accentuate the bright colors or the pastel shades of the wall stickers. • Love quotes such as ‘affectionately yours’, or ‘I shall always be with you’, or else, ‘Let us toll all our love into one this night’, and so on. These words look good under a blue light, or a decent table lamp which will focuses only on the words. • We can spice up the love and attraction quotient in our bedroom by sticking bedroom wall papers which have flower bouquet prints. 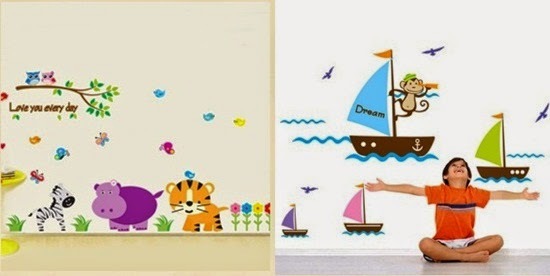 • If you are wondering about how to choose wall stickers for bedroom of the children, then masks, cartoon characters, school and fable stories, foods, cakes, pastry prints, and chocolate, elephant wall stickers can also be an excellent option. • Choosing wall papers for bedroom is a very interesting task, and all the members of the house can go through the special bedroom wall sticker catalogues which are provided by online and offline companies. 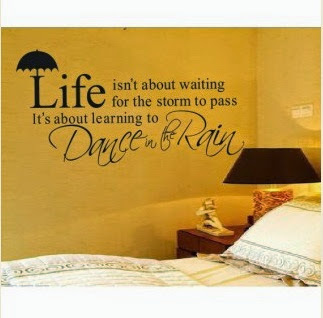 • Wall stickers for bedrooms can be clubbed with special colorful wall decals, or removable wall papers, to bring about a desired combination effect in the overall décor of the room. Moreover, it is my opinion, as I have bought and changed bedroom wall stickers frequently, that we should always buy budget-friendly wall stickers. It is really a foolish task to squander money on cheap quality wall stickers, because some of the wall stickers can really be very nice and they have an extensive longevity, even if they are priced moderately. It is important to go through the detailed price policy and cataloging of the wall stickers, before buying them through online and offline methods. Vinyl, plastic, paper and wooden stickers are popular wall décor items nowadays. They come in various designs. Bedroom wall decors make for practical and convenient room makeovers that is no wonder why most mums, and kids, opt for these awesome products. They can be installed in a jiffy and even little children can help out. We have a couple of these at home and in our bedroom and they sure add instant pop of colors in our otherwise all-blue walls. There are wide array of designs, from animals, airplanes, name it, and colors to choose from and a lot of online and offline shops now carry them, making it very convenient for anyone to get one for an exciting room makeover with the family over the weekend. Tell us about your bedrooom wall stickers in a comment below, right?